the pink toque. 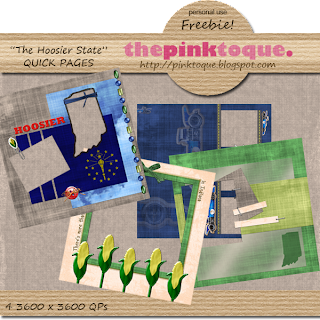 a craft blog: "The Hoosier State" Quick Pages Freebie! "The Hoosier State" Quick Pages Freebie! In other news, today is the first official regular season Bears game (versus my hometown team of the Indianapolis Colts!) GOOOOOOOOOOOOO BEARS!!!!!!!!!!!!!!! Our little family is all prepped for the game and I hope to get another scrapbook page or two together using my "I Love the Chicago Bears" freebie because Winston was an absolute doll and posed wonderfully for me in his little Bears jersey earlier, as you can see. Download "The Hoosier State" Quick Pages set HERE! Thank you! Your blog post will be advertised on the DigiFree Digital Scrapbooking Freebie search engine today (look for timestamp: 08 Sep [LA 12:00am, NY 02:00am, UK 07:00am, OZ 05:00pm] ). Oh my word, your pupkins are the cutest, I've just visited your dogster site, love the pictures.